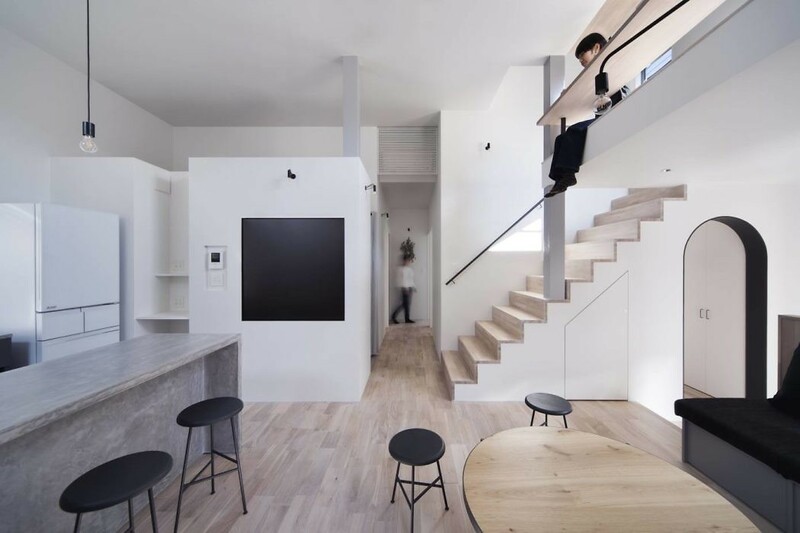 Located in Osaka, Japan, this modern eight-bedroom house was designed by SWING. This share house with eight bedrooms is located in a residential area in Osaka city. With this project, our main objective was how well we could create a plenty space that was prolific yet blended with daily sceneries within an area less than 100m2. One of the most important elements in share house projects is to have spaces that cannot be experienced in a studio apartment, so we thoroughly considered our approach to the height of each room, as well as making the most of its floor space. Our image for the shared house was that it should be a festive space in everyday life, where the ?ordinary and extraordinary? blend into that space having both ?individual and common? features. We made sure to keep an appropriate height for each space, by considering the balance between the appropriate space for the bedrooms and an open feeling for the shared living room. The look through the mezzanine to the ?borrowed scenery? of the trees lining the street from the window secures a place with an open feeling within the high-density city. In designing, we put the most importance in the idea that this is a house with eight different lives brought together. We believe that we’ve created a unique but comforting feeling of sharing the whole of a carefully-made space within a community.